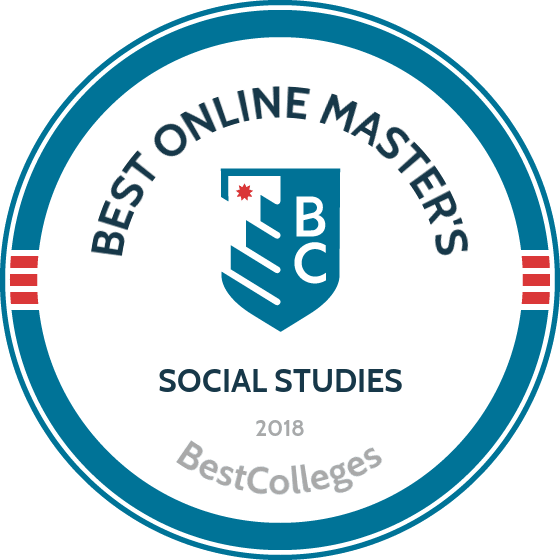 What Are The Best Online Master's in Social Studies Programs? What Else Can I Expect From an Online Master's in Social Studies Program? If you are a social studies teacher with career goals in educational leadership and professional state licensure, pursuing a master's in social studies is a sensible choice. Since social studies is a competitive endorsement area, an advanced degree may be the key to advancing your career. Among the competitive advantages available to graduates are the potential for salary increases, additional teaching endorsements, and leadership opportunities. While not all states require teachers to obtain a master's in social studies education to renew a teaching certificate, some states do, and expanded interstate licensing agreements often permit licensed graduates to become qualified to teach in other states. Graduates can also continue on to pursue a doctoral degree, particularly if their interests lie in research, administration, or instructional leadership. The U.S. Bureau of Labor Statistics (BLS) projects a favorable 8% employment growth for high school and middle school teachers through 2026. Located in Manhattan, New York University offers students the chance to combine a full-time paid teacher residency with online coursework through its master of arts in teaching social studies. NYU's master of arts in teaching social studies prepares future teachers for a career instructing students in grades 7-12. Through the 30-credit curriculum, students learn how to adapt to various learning environments, how to teach and understand students with special needs, and how to create a culture of success for both teacher and student. Applicants to this program are not required to have previous education experience, but they are required to have a bachelor’s degree with a 3.0 minimum GPA, liberal arts and sciences prerequisites, GRE or MAT results, and a completed admissions application. NYU offers scholarships and student loan options, and Great Oaks Charter School participants are able to get free residential housing. Graduates of this program are also eligible for New York state initial certification to teach social studies to students in grades 7-12. Located in Fort Lauderdale, Florida, Nova Southeastern University teaches students pursuing a master’s in social studies education the knowledge and skills they will need to be successful middle and secondary school teachers. Among other topics, the 37-credit curriculum delves into methods for teaching social studies, contemporary social problems and issues, American history, and world history. Using a variety of techniques, students learn to develop their own curricula, create relevant assignments, and instruct their own students. Nova Southeastern University's master’s in social studies education is available completely online. Students from all over the country and world are grouped together by term start date and progress, which allows them to interact with each other (and their instructors, of course) throughout their eight-week modules. Applicants must have a valid teaching certificate or their temporary teaching certificate accompanied by passing scores from the GRE exam, a bachelor’s degree with a 2.5 minimum GPA, and a completed admissions application. Divided into six academic areas, the master’s in social studies program at the University of Pittsburgh offers students the skills and knowledge they need to be successful middle and secondary social studies teachers. Pitt's master's in social studies degree is offered completely online and focuses on the following areas: electives, research methods, research seminar, social studies-specific pedagogy, psychological perspectives on education, and social and cultural perspectives on education. The 36-credit curriculum covers several topics in these areas including education and society, psychology of learning, and historical thinking. This master's program is delivered asynchronously, so students are afforded maximum flexibility. Applicants must have an instructional teaching certification, a bachelor’s degree with a 3.0 minimum GPA, a written statement outlining career objectives and career goals, and a completed admissions application. In addition to standard admissions requirements, international applicants are required to provide English proficiency exam results. Located in New York, SUNY College at Brockport places an emphasis on educational diversity in its online social science master’s degree. This online master's program prepares current and future educators to teach social studies to students in grades 7-12. Among other subjects, the 30-credit curriculum focuses on educational assessment and evaluation, issues in social studies education, applied history, and diversity in education. In addition to the required coursework, students pursuing their master’s in social science must also complete training for Dignity for All Students Act. SUNY Brockport's online master's program offers students the chance to complete their degree either as either part-time or full-time students as long as they finish within five years. Applicants must have their New York State initial certification in Social Studies for grades 7-12, a bachelor’s degree with a 3.0 minimum GPA, and a completed admissions application. Graduates of the social science master’s program are eligible for the college’s recommendation for New York State certification. Practicing educators interested in enhancing their certification and professional expertise may pursue a master’s in social studies education at Pennsylvania State University, located in University Park, Pennsylvania. Among other topics, Penn's online master's in social studies covers history education, citizen and civic education, public issues and ethical reasoning, and multicultural or global education. Students are able to complete the program in as little as 15 months, and if interested, online students may participate in residential classes. Applicants to this program must have a bachelor’s degree, a statement of purpose, GRE or MAT scores, two references, a written review of a relevant publication, and a completed admissions application. In addition to the standard admissions requirements, international applicants must also provide English proficiency exam scores. Finally, although it is not mandatory to have a minimum amount of teaching experience to begin the program, most students have at least one year of experience before applying. Integrating content and pedagogy from several disciplines, coursework for a social studies degree includes educational research materials and methods, global citizenship, history of American education, social studies lab work, and critical pedagogy. While courses differ depending on the school and program selected, three typical courses schools tend to offer are listed below. Instructional leadership: Interdisciplinary in nature rather than content-specific, this course covers supervisory work in social studies educational settings. Topics include shaping themes of curricula, professional development for teachers, and advising on technology. Skills gained in this course prepare students for school principal roles and other management occupations in curriculum and instruction. Secondary education methods: With an emphasis on the decision-making teaching model, this course focuses on analysis of principles and practices of teaching in secondary schools. Topics include lesson planning and implementation, developing instructional objectives, and modifying teaching. Assessments for state certification purposes may also be conducted, preparing students for secondary social studies teaching licensure. Diversity in education: This course explores diversity issues, including ethnicity, biases, language, ability, class, gender, sexual orientation, and religion, with special emphasis on equity and schools as sociocultural institutions. Students examine privilege, family systems, and identity within historical and legal contexts, and consider implications for constructing inclusive instructional practices in teaching and educational leadership. How Long Does It Take to Get an Online Master's in Social Studies? Social science master's programs typically consist of 30-36 credits, including a capstone and 6-9 elective credits. Students interested in state licensing must also complete mentored in-person field experience involving classroom observation, student teaching, and co-teaching. Most distance learners complete their online social science master's degree in two years, though some schools offer accelerated programs that can be completed in 15-18 months. Part-time students typically complete their studies in three years, though most schools allow a maximum of four years to complete the degree. Transfer credits taken as a non-matriculated student or through a related field (such as museum studies) may reduce the time needed to earn the degree, and many programs accept up to nine transfer credits. Non-thesis options can also shorten degree completion time, while thesis options add additional time. In programs structured around cohort groups, each cohort proceeds through their studies together and completes the requirements on a standardized timetable. Choosing an individually paced program offers more schedule flexibility. Initial or provisional teaching license: A master's degree is not required for initial teacher certification, though some states require teachers to earn a master's after several years of teaching with a provisional license. Information about teacher certification requirements in all states may be found through the National Association of State Directors of Teacher Education and Certification. Full professional or level II continuing license: Requirements for a professional license to teach in public schools vary by state, but typically include graduation from a state-approved master's program, completion of state exams assessing skills and content knowledge, a criminal background check, and several years of supervised teaching experience. Licensed graduates may also pursue non-teaching careers, such as curriculum development. Accreditation is a quality assurance process to ensure that schools and programs meet acceptable standards of quality, academic rigor, and continuous improvement. Since financial aid and acceptance of most transfer credits are only available to students attending programs and schools accredited by a federally recognized accrediting agency, it is worth your time to verify the accreditation status of any schools you are considering. The most widely held, respected, and popular category of accreditation is regional, which is awarded according to geographic region by one of six recognized agencies. National accreditation typically applies only to for-profit, religious, technical, or vocational schools, and is less standardized. Distance learners can also check with the Distance Education Accrediting Commission to investigate schools' compliance with national quality standards. For social studies education programs, the relevant field-specific accrediting agency to look for is the National Council for Accreditation of Teacher Education, an organization that ensures excellence, continuous improvement, and equity in educator preparation accreditation for P-12 schools. Ensuring uniform standards of accreditation is the job of the U.S. Department of Education (ED) and Council for Higher Education Accreditation (CHEA). While the ED does not accredit schools, it maintains a comprehensive list of recognized accreditors deemed reliable. CHEA oversees accrediting agencies, providing its stamp of approval and ensures that all funds disbursed through federal financial aid programs are supporting quality in higher education institutions. The ED and CHEA websites host a complete list of accredited schools and programs. Research on salary trends indicates a positive outlook for graduates of master's programs in education. According to a report from the Georgetown Center on Education and the Workforce, lifetime earnings for secondary school teachers with a master's degree ($2.2 million) exceeded those for teachers with only a bachelor's degree ($1.8 million). The table below features PayScale data regarding salary expectations at the bachelor's and master's levels for four teaching careers held by graduates of social studies degree programs. Most social studies educators with master's degrees teach in secondary schools. However, since social studies is one of the most competitive endorsement areas, many teachers also pursue alternative paths. Educators often work in instructional design or consulting roles for museums, nonprofits, and other educational organizations, or pursue leadership roles in educational administration and program facilitation. Some graduates continue into doctoral programs in education, especially those whose primary interests focus on research within the field. High school teachers instruct students in the ninth through twelfth grades. They teach subject material, conduct and grade assessments, and supervise classrooms. Building on lessons taught in middle school, they help students prepare for higher education and employment. Teachers interested in advancement into curriculum development or administration typically pursue a master's degree. Middle school teachers instruct students in the sixth through eighth grades, sometimes including the fifth and ninth grades. Building on the fundamentals taught at the elementary level, they prepare students for high school. An initial teaching license only requires a bachelor's degree, but a master's degree can help teachers advance into administration or curriculum development. Special education teachers serve students with disabilities and other special needs in educational and advocacy roles. Their duties include planning, instruction, assessment, developing individual education plans, training paraprofessionals, and making adaptations in learning environments to accommodate students' needs. Teachers with master's degrees can advance into school counselor or instructional coordinator roles. Teachers at the elementary school level instruct younger students in basics like reading and mathematics, preparing them for further education. Their duties include observation and evaluation of students' behavior, learning, health, and social development. While an initial teaching license only requires a bachelor's degree, teachers who complete a master's degree often pursue opportunities in educational leadership. Instructional coordinators direct matters of curriculum and instruction, including following teaching standards, developing and reviewing educational materials, and working with teachers and administrators to implement new material. Most instructional coordinator roles require a master's degree as well as a license in teaching or school administration. Professional organizations for social studies educators offer a host of benefits to master's students and recent graduates in the field. As a member you may receive access to special discounts, attend annual conferences and workshops, take advantage of professional development opportunities, and keep up to date on the field with subscription publications available to members only. Most organizations at both state and national levels provide fellowship, support, advocacy, job listings, continuing education, and networking opportunities. Providing support, leadership, and service to social studies educators, NCSS is the largest national professional organization for social studies teachers. Member benefits include insurance discounts, subscription publications, and an annual conference. Focused on advocacy, outreach, and scholarship in the New York area, this organization provides a professional support network regarding issues in social studies education. Member benefits include workshops, conferences, and publications. Based in California, this nonpartisan, nonprofit organization helps members develop more effective curricula in civic education at the elementary and secondary levels. Offerings include lesson plans, workshops, conferences, and other professional development opportunities. The first step in financing your master's in social studies education is to complete the Free Application for Federal Student Aid (FAFSA). You may be eligible for grants, loans, work-study, and other sources of aid. Graduate programs in education often maintain scholarships funded by alums; most are listed on schools' websites or through professional organizations. Students at the master's level also typically receive some financial assistance from employers, such as school districts.